Situated in Kanonji, this hotel is 0.1 mi (0.1 km) from Setonaikai National Park and within 3 mi (5 km) of Daikoji Temple and Motoyamaji Temple. Kotohiki Hachimangu Shrine and Kannon-ji Temple are also within 6 mi (10 km). Situated in Onomichi, this hotel is within a 10-minute walk of Setonaikai National Park, Onomichi Chamber of Commerce Memorial Museum, and Jikoji Temple. Onomichi Literature Museum and Shiga Naoya Former House are also within 15 minutes. Onomichi Station is only a 3-minute walk. 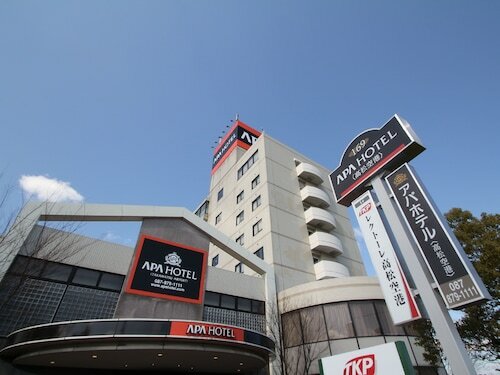 Situated in Fukuyama, this hotel is steps from Setonaikai National Park and Tomonoura. Fukuyama Castle and Fukuyama Museum of Art are also within 10 minutes. Onomichi Fukuyama Station is 6 minutes by foot and Onomichi Bingo-honjo Station is 26 minutes. How Much is a Hotel Room in Kanonji? Hotels in Kanonji start at $38 per night. Prices and availability subject to change. Additional terms may apply. You may have noticed that there are no Travelocity-accredited hotels options within Kanonji. Don't worry, because about 15 hotels can be booked within 19 miles (30 kilometers) of Kanonji. The closest Travelocity-listed accommodation is the Hotel Sunroute Seto Ohashi, Kagawa, which is 18 miles (28 kilometers) from the downtown precinct of Kanonji. A different choice is the Hotel Route-Inn Sakaidekita Inter, situated in Kagawa, 19 miles (31 kilometers) from the central area of Kanonji. The Hotel Route-Inn Marugame is around 15 miles (24 kilometers) outside of the town center of Kanonji. Another option is the Chisun Inn Marugame Zentsuji, which is positioned 14 miles (22 kilometers) away. 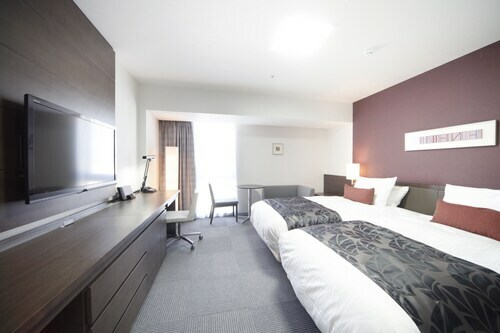 The HOTEL LiVEMAX Iyo-Mishima as well as the APA Hotel Marugame-Ekimaeodori are some other accommodation options worth looking into around Kanonji. When you've got the time, you could travel to other parts of Shikoku. Discover Shikoku's castles and traditional villages. Anyone seeking some fresh air should also put aside some time to admire its rural landscapes, coastal plains and mountains. Daring visitors might also throw themselves into mountain climbing, hiking and cycling in the region. Tokushima is 50 miles (83 kilometers) to the east of Kanonji and boasts Awa Odori Kaikan and Tokushima Castle. The Tokushima Tokyu REI Hotel and Tokushima Grandvrio Hotel are some of the convenient hotel choices in Tokushima. 50 miles (83 kilometers) west of Kanonji, is Matsuyama, home to the Hotel Okudogo and Hotel Mielparque Matsuyama. The Matsuyama Castle and Across Shigenobu are some of the more frequented places to experience while in Matsuyama. Before saying your farewells to Shikoku, you sure ensure you catch an exciting game. Swing by Kanko Stadium, which you can find to the north of Kanonji. Find a Travelocity-listed room in the middle of the sporting action at the Okayama Royal Hotel or the Hotel Granvia Okayama. Researching the most convenient airport for Kanonji? Takamatsu Airport is 20 miles (35 kilometers) away.